X Marks the Spot: The X-Men Franchise Is Given A Second Chance | You gotta get a critic. You could say that the X-Men film franchise officially bit the dust with Brett Ratner’s clumsy X-Men: The Last Stand back in 2006. It’s taken eight years and two movies since then to return to the same caliber of filmmaking that came with the first two original X-Men films. Of course, we can credit some of this to Bryan Singer’s return as the director of the latest film, X-Men: Days of Future Past, but also a strong story by Simon Kinburg with just the right amount of ingenuousness and emotional care. Unlike, say another group of Marvel superheroes (ahem, the Avengers), the X-Men have always been and will always be a makeshift family of outsiders banning together to face a world that hates and fears them. X-Men: Days of Future Past is definitely a movie for fans of both the film franchise and for the comics as it should be. Back in January of 2013, when Bryan Singer started tweeting cast members who were returning to the movie (including original ones like Patrick Stewart, Ian McKellen, Hugh Jackman, Halle Berry, Anna Paquin, Shawn Ashmore, Ellen Page, and Daniel Cudmore), I got excited. Somehow the original actors would band together through the vehicle of time travel to share the screen with the X-Men: First Class counterparts James McAvoy, Michael Fassbender, Jennifer Lawrence, and Nicholas Hoult. 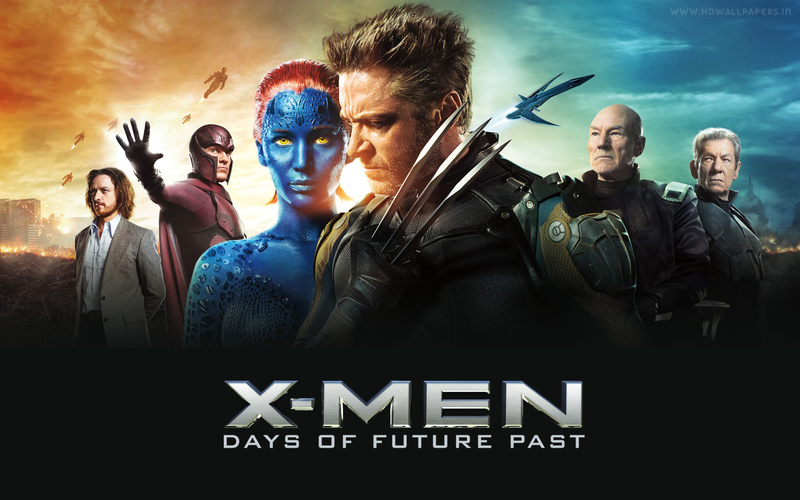 Days of Future Past is probably the second most important story in the X-Men mythology (behind the Dark Phoenix saga which the filmmakers royally screwed over in The Last Stand). Chris Claremont and John Bryne’s story has traces of a world gone mad where mutants are put into concentration camps after the robot-hunting Sentinels take over. Humans are gone and the remaining survivors band together to send Kitty Pryde back into her younger body to warn the X-Men of an assassination plot that will ruin their future. The film take the same basic premise and replaces Kitty Pryde with Wolverine (because apparently after hogging the spotlight in three movies and having two of his own films, he needs another chance to have more screen time). Peter Dinklage’s Boliver Trask is Mystique’s target this time around instead of Senator Kelly (who was killed off in the first X-Men film). Ultimately, with so many mutants some are going to get the shaft and this time around, unfortunately, the ladies get the short end of the stick. While Jennifer Lawrence’s Mystique brings the much needed emotional resonance of the story (and a killer job at speaking Vietnamese), Halle Berry’s Storm is relegated to essentially one action scene. I heard that an empowering speech by Storm was apparently cut for some reason (it also didn’t help that Berry was starting to show in her pregnancy while filming and couldn’t be there that long). Back in December, Bryan Singer said the entire scene featuring Anna Paquin’s Rogue was cut completely because they felt it was detracting from the overall flow of the story. Originally, Magneto, Ice Man, and Professor X go on a solo mission to rescue Rogue from Xavier’s Mansion (now essentially a mutant prison) because Ellen Page’s Kitty (very spunky here and in real life), is injured and the only one that can keep Wolverine in the past now is Rogue. The scene will be on the DVD/Blu Ray, but it broke my heart to see her relegated to a non-speaking quick blink and you’ll miss her cameo at the very end of the film. However, the movie does the biggest disservice to Kitty Pryde. In the comics, this is her story. She is the protagonist and she is the one who travels back in time and gathers the X-Men of the past to stop the assassination. The filmmakers decided to give her a new power (without explaining how she got it…they could have had one line about secondary mutations that would have satisfied fans, but they didn’t do that) of sending people’s consciousness back in time. Only Wolverine can withstand the pain because of his healing factor and thus he’s chosen and of course gathers a Serpico-looking drug-addicted Professor X, a sad sack Beast, and still powerful Magneto together to stop Mystique. Of the X-Men: First Class actors, Michael Fassbender stands out the most to me. He’s really come into his own as an actor and I can genuinely believe that he grows up to become Ian McKellen. James McAvoy does a decent job, yet Patrick Stewart still overshadows him. Evan Peters’s Quicksilver (while having a ridiculous costume) quite literally steals the movie with his speedster antics set to “Time in a Bottle.” I’m glad that he’ll be back in X-Men: Apocalypse. The future X-Men (Sunspot, Warpath, Bishop, and Blink) aren’t really given much to do, but visually Blink and Bishop looked the most like their comic book counterparts and I thoroughly enjoyed seeing them in action. It’s a shame that the future X-Men are given so little screen time. I could have easily done with another 20 minutes of them. The Sentinels (both past and future versions) are really quite well designed and I honestly got chills when they started killing the future X-Men (especially when Storm died in the same iconic way she did in the comics). I saw the film the first time in 3D and having now just come back from a second viewing in regular 2D, I can say that I preferred it in a non-3D format. The storyline allowed the franchise to be reset and allow The Last Stand to essentially never happen, bringing back James Marsden’s Cyclops and Famke Janssen’s Jean Grey. These two cameos at the end (along with Kelsey Grammer as Beast) brought a big smile to my face. The ending with the tease of the origins of Apocalypse nicely set up the next film. I’m hoping that we’ll get a chance to see young versions of Cyclops, Jean Grey, Storm (please make it be Lupita Nyong’o), Nightcrawler, Gambit, and heck, why not throw in Dazzler if it’s going to be set in the 1980s. Overall, on a second viewing I found X-Men: Days of Future Past to be a treat for fans of the comics and a nice way to sweep under the rug the mistakes of the past few movies. The major criticism I have of the film is that it still doesn’t give the women of the X-Men much to do and leaves the action to the men. Hopefully, X-Men: Apocalypse will feature some kickass action and character development for Storm and Jean Grey. I also hope that the DVD/Blu Ray of Days of Future Past will feature an extended version of the film with Rogue’s parts kept back in, but I’m going to try not to get my hopes up. 3 1/2 out of 4 stars.